Do you have sensitive skin and love natural skincare products? If so, this review is just for you! 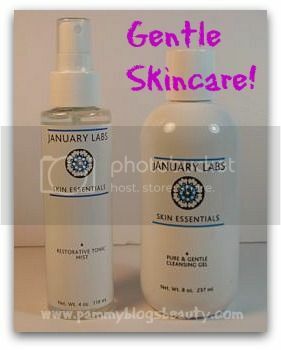 January labs is a new natural product line. January Labs was founded on the idea that skincare does not need to be complicated! The products are formulated without any harmful or unnatural ingredients. They contain skin-loving ingredients such as enzymes, antioxidants, and essential oils. 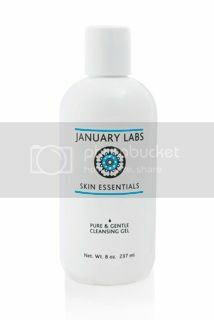 January Labs products are sulfate-free, paraben-free, vegan, cruelty-free, gluten-free, petrolatum/mineral-oil free, and packaged in recyclable material. I have sensitive combo skin. In the warmer months, it leans towards normal or normal to oily (just in t-zone). As the weather gets cooler, my skin is more combo normal-dry. My skin is prone to redness and many products seem to irritate my sensitive skin (and make my skin more red or will sting and irritate). While I don't break out often, random zits do crop up occasionally. Products that are too rich seem to break me out more. I have no major lines or wrinkles yet. However, since I am in my (cough) late 30s, I am all-about age prevention! I am seeing the start of some expression lines and want to hold those at bay. 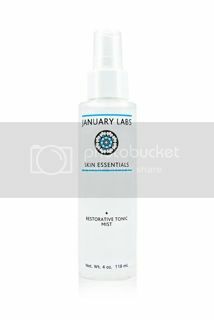 For this review, I tested out the January Labs Skin Essentials Pure & Gentle Cleansing Gel, the Moisture Balancing Lotion, and the Restorative Tonic Mist. Keep reading to find out more about these great products! These products were formulated especially for sensitive skin. When it comes to cleansing and toning, often the best thing you can do for your skin is "go gentle". If you start out with a basic and gentle cleanser and toner, you really reduce irritation in your skin. My goal is always to cleanse gently to remove dirt and oil as well as prep skin for treatment products. These products are simply packaged in recycled plastic bottles. The toner comes with a spray dispenser and the cleanser a flip top lid. I did find that the cleanser bottle was somewhat hard to squeeze and often just unscrew the cap to dispense. This non-foaming cleanser is formulated especially for sensitive skin. It is a clear and non-drying watery liquid (almost like a very thin gel). It smells soooo lovely! Like citrus...or is it lemongrass? Either way, the scent is very "clean" and refreshing without being overwhelming. The cleanser feels soothing on the skin while removing impurities and makeup. You only need a small amount of product (a dime size) to clean your entire face. So, this large bottle shall last awhile! It rinses clean without leaving a residue nor leaving you feeling tight. Be careful though! I found that it really stung it it got in my eyes. Despite the eye stinging, I really did like this cleanser. I just need to be super careful to keep it out of my eyes (I keep them closed tight when using). Key Ingredients Include: While Willow Bark (a naturally occurring form of salicylic acid: prevents breakouts), Green Tea Extract (natural antioxidant: soothing), Vitamin C (decrease inflammation while giving antioxidant protection), Licorice Root Extract (reduces skin discolorations), and Vitamin E (antioxidant protection, plus it hydrates). This product is an alcohol-free hydrating spray toner. It is designed to tone, hydrate, and balance your skin. I apply after cleansing in the morning and evening. You can either mist it directly on your face or spray into hands and pat onto face (what I do). It feels refreshing and is completely gentle. I always use aloe and Sodium PCA-based toners and this one from January Labs is great! This is a truely gentle and basic face lotion. No bells and whistles: just a nice lotion that hydrates! Often it seems that it is hard to find a good basic moisturizer...something that hydrates without irriation. I love how this lotion boosts my skin's hydration without irriation and without causing breakouts. Plus, it does have some nice skin-loving ingredients packed in it too. I smooth this on after cleansing in the mornings and evenings. Overall, I am really pleased with January Labs! The products are all no-frills basics that are a great addition to my skincare arsenal. Gentle cleansing, toning, and moisturizing are key steps to any great skincare routine. My skin really likes these gentle products! I will continue to use these products in-between other product testing. 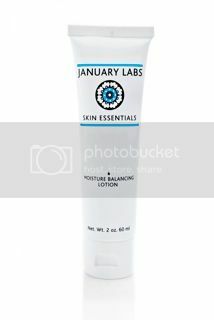 January Labs products are available at JanuaryLabs.com, top day spas nationwide, and in the NewBeauty store inside Fred Segal Santa Monica. The Skin Essentials Restorative Tonic Mist retails for $24.00 for 4 oz, the Moisture Balancing Lotion retails for $28.00 for 2 oz, and the Skin Essentials Pure & Gentle Cleansing Gel retails for $32.00 for 8 oz. I've never heard of this line at all, so thank you for the review. it sounds like something I should put on my list to try since I have sensitive skin.